Before long I was doing table tops, 360 spins, and back flips — not in real life, but in video games. It wasn’t easy to keep up with west coast trends when you lived in the Midwest, but with games like 720, Skate or Die, and California Games, I could live out my skateboarding and BMX dreams without ripping open my pants… or my chin. Fast forward thirty years. Today, most of my extreme sport participation takes place with games like Moto-X-Mayhem and Stickman BMX on my iPhone, usually while sitting in the bathroom or chilling in my recliner after a long day of shopping for antiques and yelling at children to get off my lawn. These days, the thought of performing an acid drop off a sick vert ramp sounds more like an insurance liability than a good time. Also at my age, I sound really lame saying things like “acid drop” and the word “sick,” unless I’m using it to describe how I feel after taking my Centrum Silver One-A-Day Multivitamin on an empty stomach, before I’ve had my oatmeal. 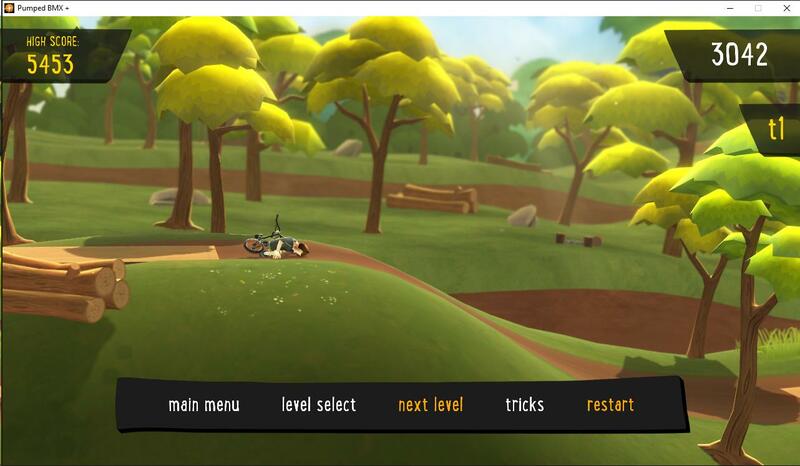 Pumped BMX+ by Yeahus is a sick BMX game. 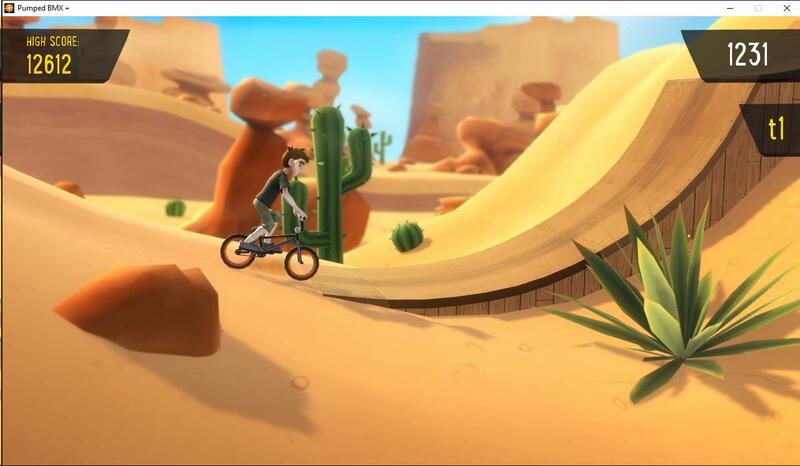 For clarity’s sake, Yeahus has produced three similarly named games: Pumped BMX 1 and 2 (both for iOS/Android), and the non-mobile phone version, Pumped: BMX+, for the Wii-U, XBox One, PS Vita, PS3, PS4, and Steam. My friend Roody Yogurt was kind enough to gift me a Steam code for this game and so that is the version I will be reviewing. In my mind I am young and hip and cool. I am a friend to the kids and their Pokemon Go, and support the dudes with their Tor browsing and their smartwatches. In reality, I am an aging buffoon. After downloading Pumped BMX+, I spent days — DAYS! — trying to figure out how to control this knobby-wheeled game. 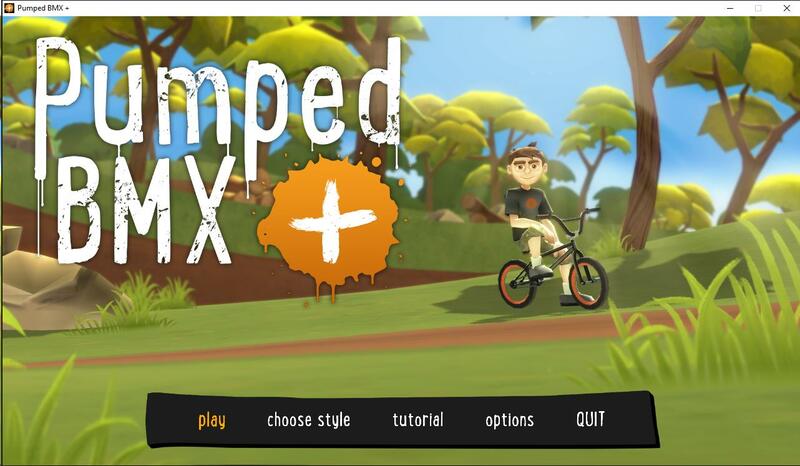 If you happen to use an Xbox 360 controller with Steam, Pumped BMX+ is simple to control. 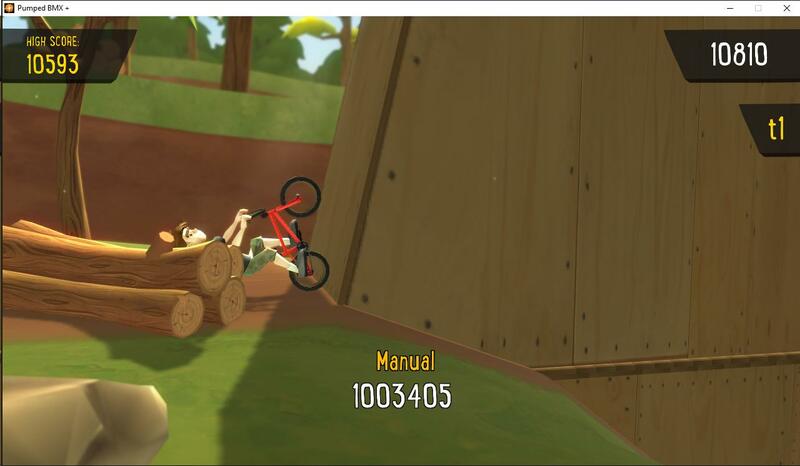 The left analog stick controls your bike while the right analog stick is used to perform tricks. The “A” button is used to speed up (think “pumping in the transition” — or, if that analogy means nothing to you, simply think “Tiny Wings”), and the controller’s trigger is used to enable a second set of more difficult tricks while holding it down. I don’t use an Xbox 360 controller on my computer. Instead, I use an old USB Gravis Gamepad Pro that was released four days after USB was invented. If at any time the instructions had informed me that the game required two analog sticks, I wouldn’t have spent hours trying to reconfigure my limp controller and installing TocaEdit’s X360 Controller Emulator in a vain attempt to make my gamepad work. There is a way to play the game using your keyboard, although Yeahus has hidden this information so well that it’s like a secret of the Masonic Temple. It’s not mentioned on Steam, in the game, in the tutorial session, or even on the Yeahus website. After skimming through multiple customer reviews of the game, I discovered that you can use the keyboard’s arrow keys for the left analog stick and WASD for the right stick. That means every time the game says “use the left stick” you’ll use the keys under your right hand, and vice versa. Instead of the controller’s “A” button you can use the space bar, and either shift key works as the trigger. What all of this means is that to perform some of the moves you will need to hold down the space bar, release it, and press one or two of the arrow keys while holding down shift and holding down one or two of the WASD keys at the same time. Later, when trying to perform trick combos like a barspin to 360 suicide to back flip Superman, you’ll need to press roughly a dozen keys with the dexterity of Herbie Hancock within a matter of seconds. If you can do this with a keyboard, you are talented enough to be in the real X-Games and have no reason to be playing video games like this one. If the only professional skateboarder you can name is Tony Hawk then you will most likely be spending a few minutes working through the game’s five tutorial lessons while learning how to control your gnarly little man. It took me a dozen tries to clear the first tutorial level (which only involves jumping and landing) and a couple of minutes to coast through all rest. The hardest part of the tutorial is dealing with the steady stream of pop-up windows that appear and pause the game, throwing off the timing required to complete some of the tricks. Before starting the actual game, players can customize the look of their character. There aren’t a ton of choices — nine different bicycles, eleven helmets, and six outfits — but this is freestyle BMX, not Barbie’s Dirt Track Vacation. I liked the fact that the game doesn’t force you to wear a helmet because, let’s face it, if you land on your head while attempting a double back flip to tail whip, that plastic dome strapped to your noggin’ ain’t gonna save your melon. I selected Outfit #5 for my character (a t-shirt, cargo shorts, and gray tennis shoes) because that’s what I was wearing in real life. Once you launch the game you’ll find five levels: Local, Flow, AM, Pro, and Legend. Each level contains eight tracks, and each track contains three difficulty levels of achievements to unlock. On level one, track one, the easy achievements include completing the level, scoring 7,500 points, doing one 2,000 point trick, and performing a barspin. For the advanced achievements, the score raises to 13,000 and you’ll need to land a 4,500 point trick. All the tricks are listed in a pop-up menu so figuring out how to perform them isn’t hard — but again, if you’re playing with a keyboard, you’ll have to remember that when the game says to perform a Can-can you need to hold down the trigger and press the right analog stick diagonally down/right, that really means holding shift, S, and D at the same time. The game is pretty picky about hitting multiple keys at exactly the same time. The easy achievements are, well, easy, while the more advanced ones may take some planning and knowledge of the track. You can pull a barspin off at any jump, but it’ll take more speed and landing room to successfully nail a front slip Superman. In the advanced levels you may find that particular combos can only be pulled off at one specific area of the track. As you advance further into the game you’ll begin to see more terrain, like snow and sand. Also, if you play long enough, you’ll encounter a few glitches. 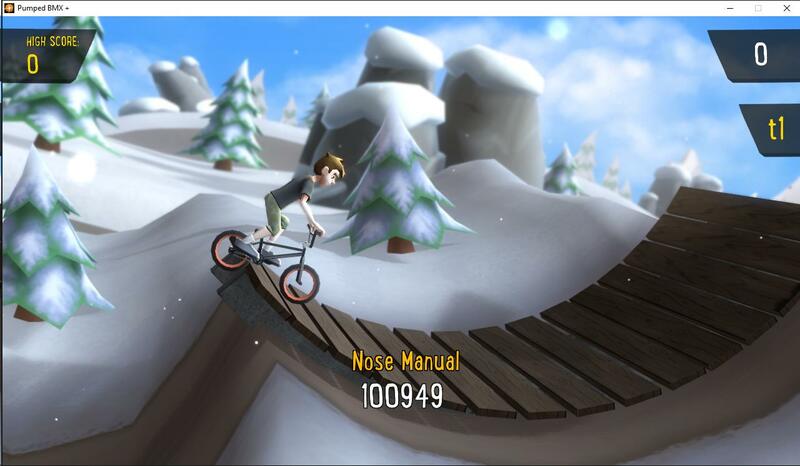 The first time this happened, I managed to land a nose manual on the end of a bridge. While I was stuck there, the game kept adding points until I finally aborted the level. It happened again a few minutes later when I landed awkwardly at the bottom of a ramp. I let it run up to a million points, just to see what would happen. I’m pretty sure this is not allowed in the real X-Games. It’s not that the overall game is glitchy, but rather specific points in certain levels simply aren’t programmed well. I encountered these same glitches over and over again in the same spots. It took roughly 30 minutes to unlock everything in the first seven stages of level one, and another two hours to unlock everything on level eight. Sometimes it seems like what you are required to do is simply impossible, and after trying the same trick combo for over an hour using the keyboard, my fingers began cramping and my wrists were on fire. That is one of a million reasons why I am not in the real X-Games. When I reached the desert levels, it hit me why I enjoy this game so much. 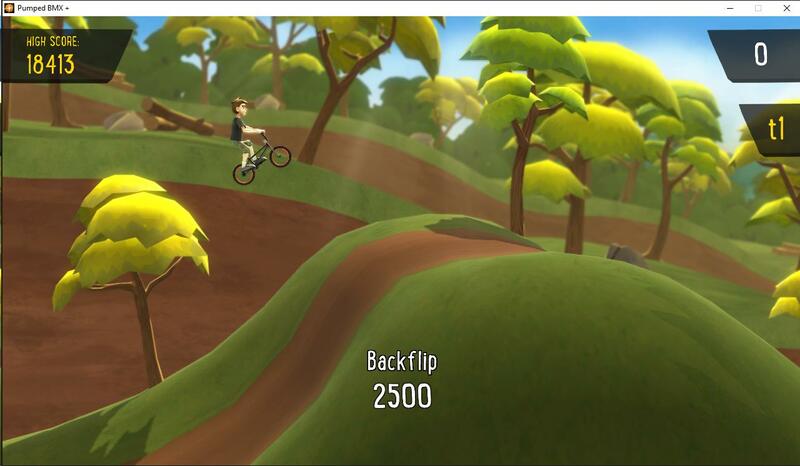 Pumped: BMX+ is literally an updated version of the BMX level of California Games, from the sarcastic comments after each crash to the short races and quick tricks. 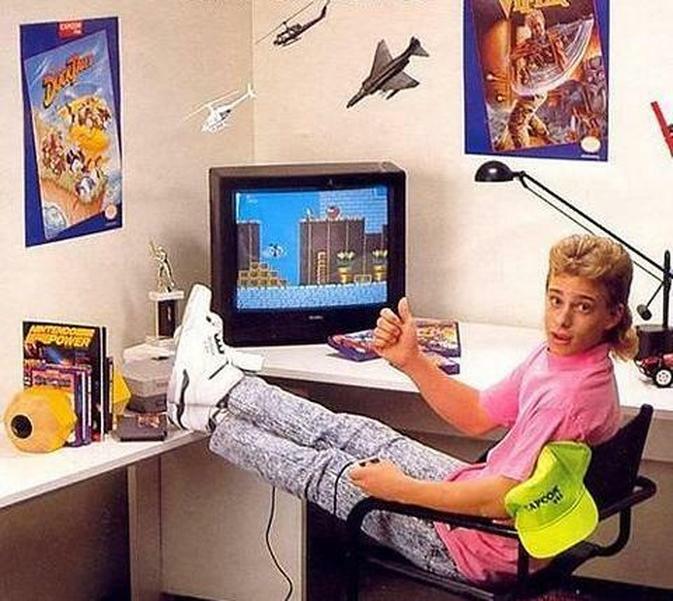 I love and miss the 1980s. I will never again own a Miami Vice jacket or a pair of blue fingerless gloves, but the nostalgic memories remain. 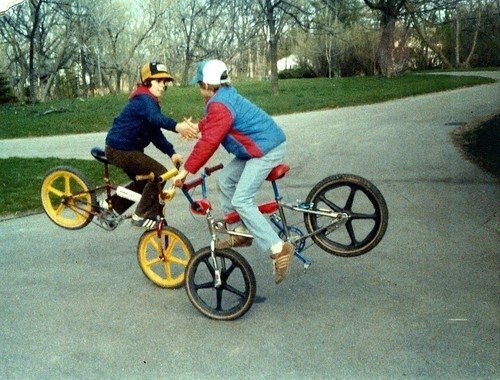 In my room, I can put on the Fat Boys Greatest Hits, pop open a can of Shasta orange soda, and fire up Pumped BMX+, where I can perform tubular BMX tricks without the fear of breaking any bones or trespassing on other people’s property. Thumbs up from me!